The definitive legal performance improvement solution cascades the transformation of individual personal skill sets into major improvements in corporate legal department and law firm performance, leading ultimately to new, mutually profitable client-law firm relationships. To do so, Smarter Law uses the broadest possible range of proven techniques spanning "left brain" thinking (logic, big data analysis, agile, design, econometrics) and "right brain" approaches (emotions, neuro-linguistic programming, stoic philosophy, Rorschach inkblots). From emotional intelligence to artificial intelligence, soft skills and hard data, this is modern behavioral economics in the Freakonomics and Malcolm Gladwell mold. It’s practical … and funny too. 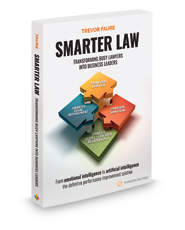 Since 2011, as global leader of Legal Services for EY and then as head of independent consultancy Smarter Law Solutions, Faure has helped transform the performance of over 250 law firms, in-house legal departments, and individual attorneys around the world, and create client-firm relationships that deliver greater client value while enhancing law firm profitability. The results of these successes represent the definitive performance improvement solution: Smarter Law. Not just "more for less" anymore, but a quantum leap to “better quality and rewards for less” for the first time.